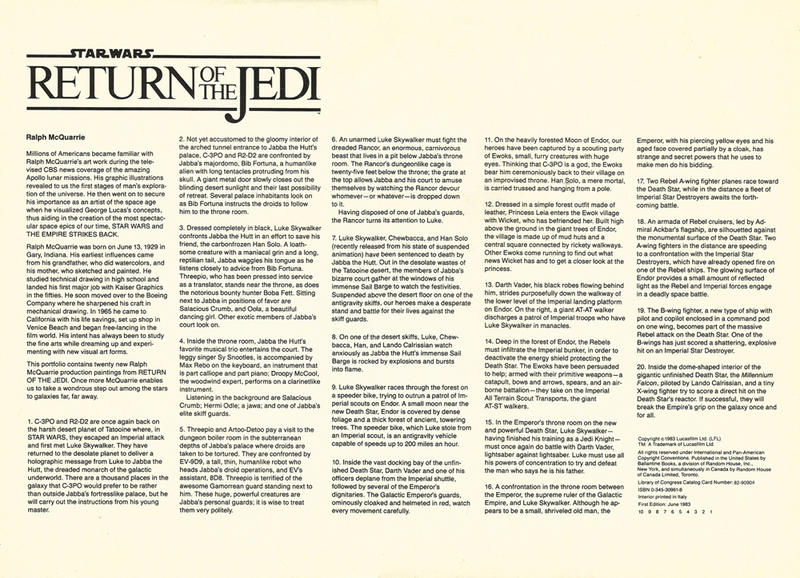 Star Wars: Return of the Jedi Portfolio, Plates 9-14 (1983) | 'TAIN'T THE MEAT… IT'S THE HUMANITY! 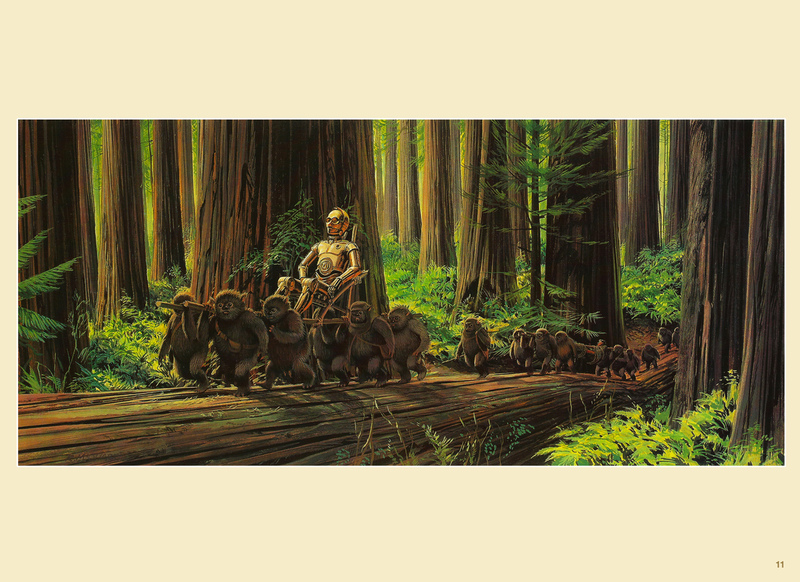 Published by Ballantine Books in 1983, and released to capitalise on the huge success of the film, the Star Wars: Return of the Jedi Portfolio featured 20 full-colour production paintings by Ralph McQuarrie, one of the film’s concept artists. 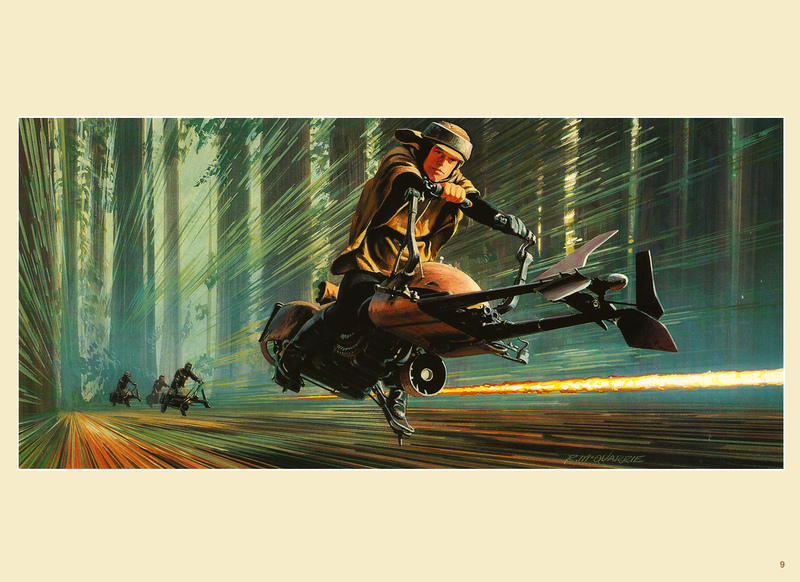 McQuarrie, a hugely gifted technical illustrator, had originally worked for the Boeing Company before moving to California in the mid-1960s to pursue movie work. Hired by George Lucas to create concept designs for Star Wars he was instrumental in creating the film’s distinctive visual style. McQuarrie then worked on The Empire Strikes Back before moving on to Return of the Jedi. Portfolio sets for Star Wars and The Empire Strikes Back (also published by Ballantine), featuring concept and production paintings by the artist, had proved a huge hit with fans – the Star Wars set sold over a quarter of a million copies alone (click here for a closer look at the portfolio). Ballantine clearly hoped that a portfolio based on the trilogy’s third film would prove equally popular. 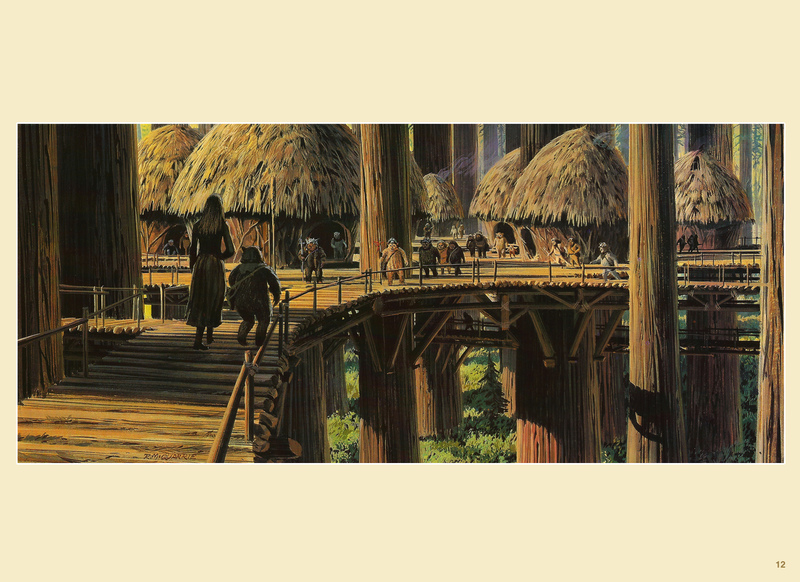 But unlike the portfolios for Star Wars and The Empire Strikes Back, the Star Wars: Return of the Jedi Portfolio collected paintings the artist made after filming was completed. 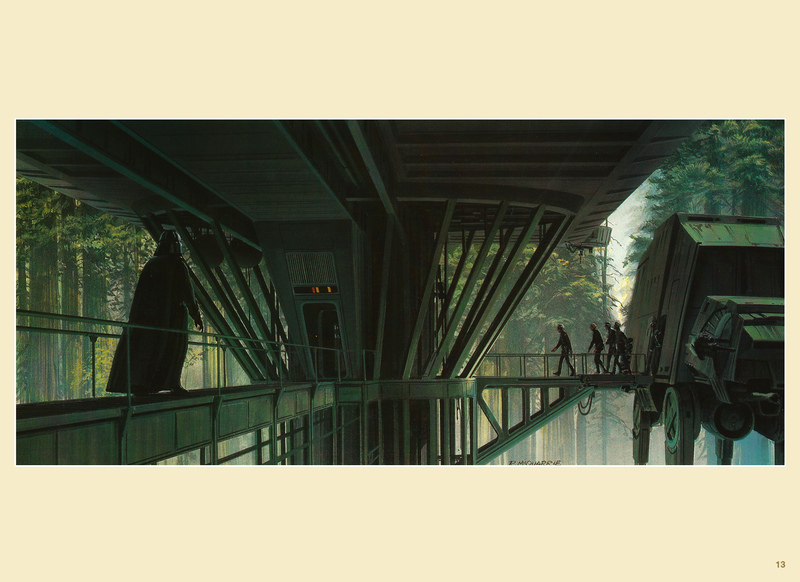 McQuarrie worked from stills taken during filming so his artwork is his own interpretation of the scenes. 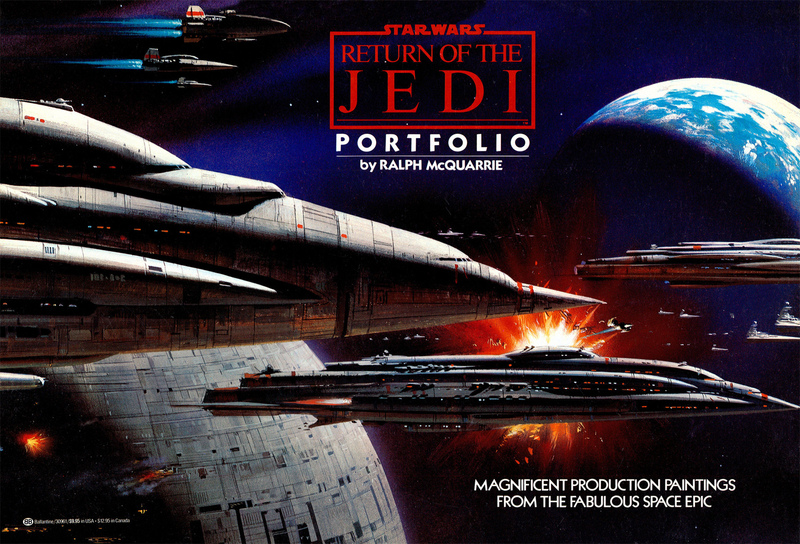 The Star Wars: Return of the Jedi Portfolio contained twenty 15.5 x 11in paintings printed on high-quality paper stock. A caption sheet with a biography of McQuarrie was also included, and the set shipped in a sturdy fold-out cardboard folder. The portfolio originally sold for $9.95 (about $25 in today’s money). 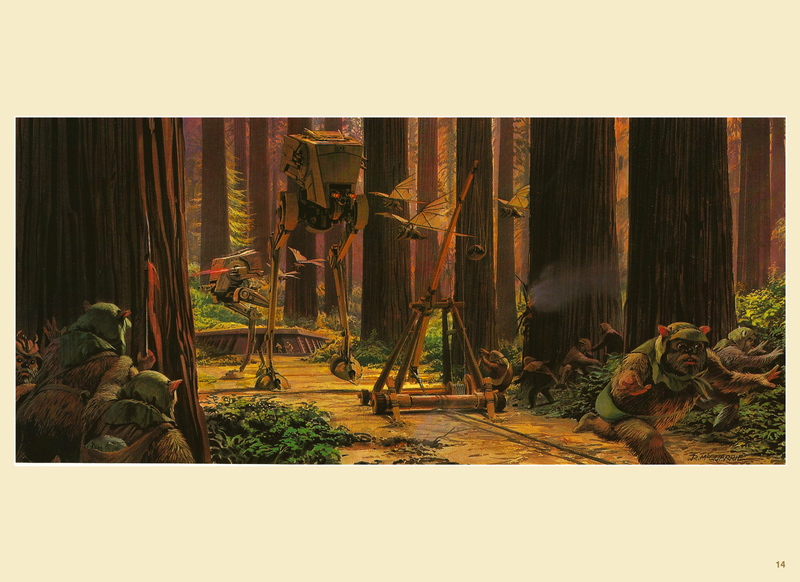 Below are the second set of prints from the portfolio – Plates 9 to 14 – which are all from the film’s second act, the battle of Endor. Click here for Plates 1 to 8. 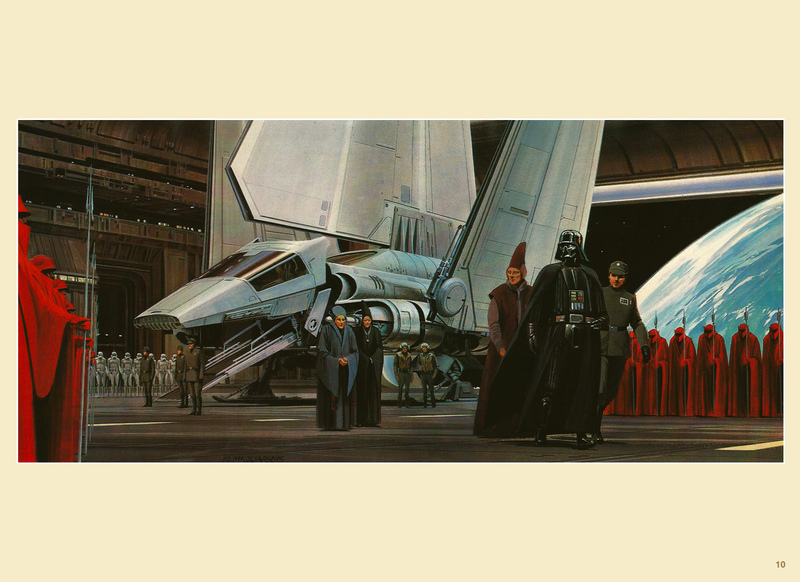 I’ll post the final set of prints from the collection – which depict the attack on the Death Star – next week. (Update: click here).